In the historical western town of Fort Worth, Texas, matchmaking mother, Eugenia Burnett, has achieved her goals. Her three sons are happily married, and she has three grandchildren, with the fourth on the way. But she hasn’t given up her matchmaking ways. Now she’s introducing lonely widows and widowers. Until one widower, rancher Wyatt Jones, lets her know he’s only interested in one woman, her. Sworn never to remarry, Eugenia doesn’t want a husband. But Wyatt wants Eugenia and he’s one determined cowboy. Come celebrate a western Christmas with the Burnett family and watch Mama Burnett meet her match. What Reviewers Are Saying About This Western Holiday Romance! Download this western Christmas novel and start reading now! Finally an older bride. 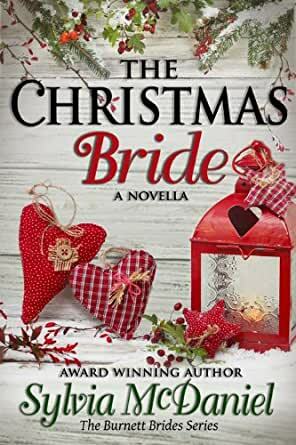 It was exciting to read about an older bride, because there is no age to be in love..
And Wyatt, darn that man is hot... kind, caring, loving. Wyatt has a heart of gold. For him where is life is hope. He is alive and well and knows what he wants, he wants Eugenia. But Eugenia is stubborned even she knows she is attracted to Wyatt. You will enjoy the story and I hope to read many more like that. This book was a lovely follow up to the books where Eugenia played matchmaker for her three sons. They turned the tables on her and that makes for a wonderful story. Truly enjoyed all four stories! Eugenia Brunnet has meddled in her three sons lives to play matchmaker. This time, the tables are turned. It's time for Eugenia to get a taste of her own medicine. Wyatt Jones lost his wife to sickness years ago and is ready to explore the attraction he has long felt for Eugenia. He is patient in his dealings with Eugenia's fears about marriage and control. But a man can only be patient for so long and Eugenia isn't budging. Will Eugenia's fears keep them apart? Or will Wyatt break down the barriers surrounding her heart?